To reduce the lower back’s effort and limit the hamstrings tension, it’s possible to do like powerlifters by putting the barbell on posterior deltoids. 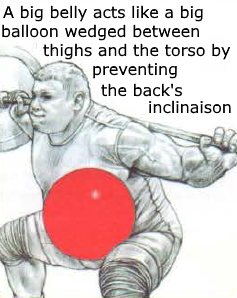 This technique decreases the cantilever and increases the power of lifting from the back. This allows you to lift heavier weights. 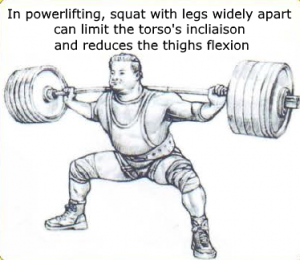 By using powerlifter of weightlifting shoes (solid raised heel) or a wedge under the heels, this reduces the cantilever by having the buttocks not too back by the advancing knees. This allows for greater amplitudes with the thighs flexion. With that, we feel better the quadriceps work by limiting the torso’s inclinaison and the work of the gluteus maximus and spinal erectors. The low barbell and raised heel combination allows you to lift heavier weights. This technique is recommended for rangy people and people with stiff ankles to correct their positioning at squat. 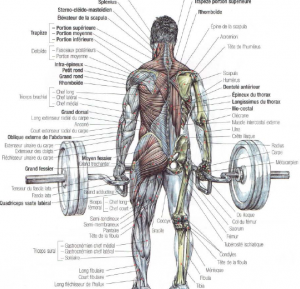 Front squat limits the torso’s inclinaison. This has the effect of reducing the work of the lower back, decrease the tension of hamstrings muscles and adductor magnus muscle. On the other hand, front squat increases the cantilever, which forces quadriceps to make more effort to extend the thigh on the leg. Which means it’s the perfect squat for thighs. But it’s not possible to lift heavyweights like the classic squat and it’s recommended to do it with heels elevated for better stability. 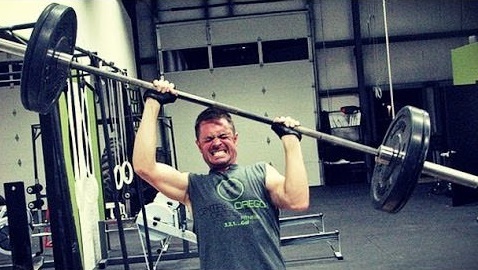 For rangy people, front squat is very hard to do. The torso of rangy people is more inclined, which make it more difficult to hold the barbell which may fall forward during the execution of the movement. 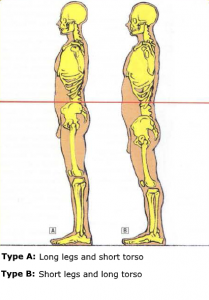 There is a squat’s technique to limit the torso’s inclination. This involves spreading the legs with the feet outward. Some powerlifters do this technique with the legs almost wide apart. With the legs apart, this limits the legs flexion. 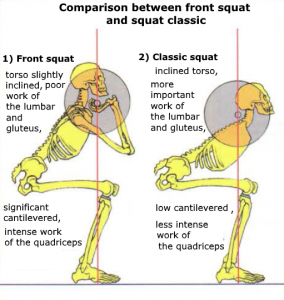 To be able to squat with the legs apart, it’s necessary to have an adequate bone conformation of the hip joint and to be flexible of the thighs adductor muscle. Which means, it’s a technique that can’t be used by everyone. 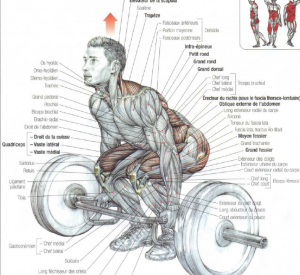 Having a big belly for squat and deadlift allow to compress it against the thighs. This helps to limit the inclination of the torso and the back’s rounding. This has the effect of protecting the lower back and limiting the risk of herniated disc. It’s for this reason that we can see a lot of heavyweight champion of powerlifting or weightlifting with a big belly. They take care to keep their belly fat with an excessively rich diet. In bodybuilding, it’s important to take into account the different morphologies of the individual and especially for the knees. 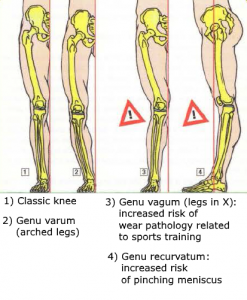 Arched legs (genu varum) are not more risky than normal legs. For people with X legs (genu varum) or people who can overly extend the thighs (genu recurvatum), it’s often recommanded to not do leg exercises with very heavy weights. 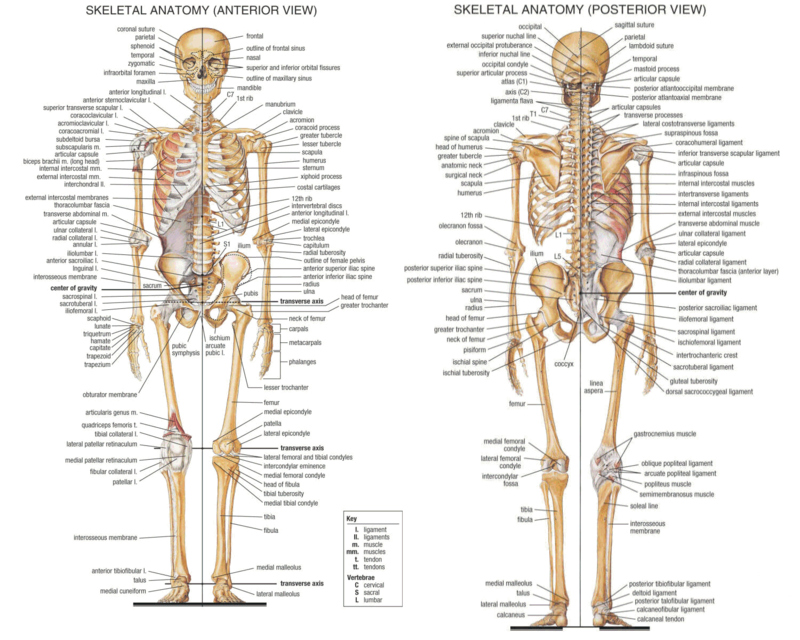 In people who were overweight during their youth when leg bones weren’t fully developed and still « malleable ». Legs are deformed because of the overload. Now, they have this X shape. In women. 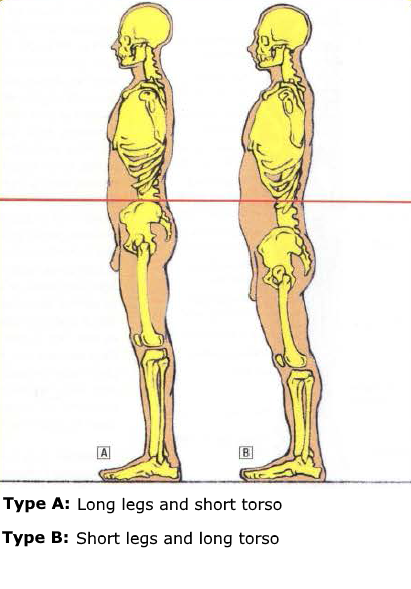 The fact that women have wider hips to have children, this influences the femurs direction which are generally more inclined. 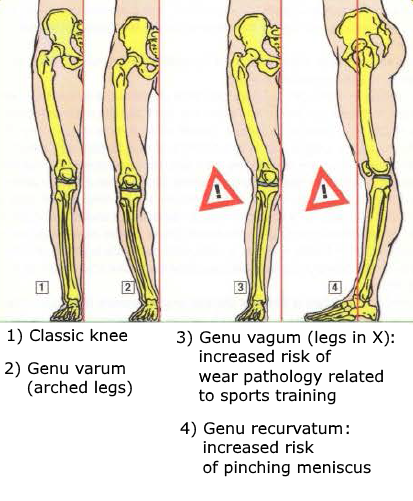 For people with genu valgum. If the genu valgum is to excessive, the joint would be overused. 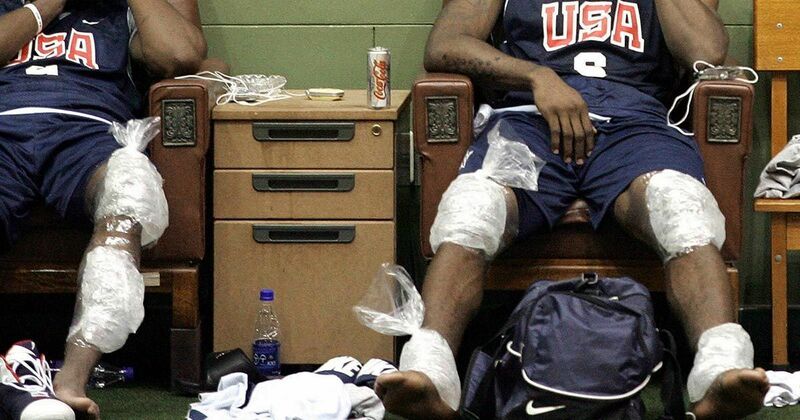 The medial collateral ligament would be extremely tense. The lateral meniscus, the articular surfaces coated with cartilage of the external condyle of the femur, and the external lateral tuberosity of the tibia would be subjected to excessive friction, which would cause pathologies of wear. For people with genu recurvatum. 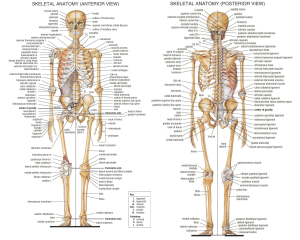 These are people who are essentially very flexible named hyperlaxes or women whose muscular and ligamentous hyperlaxity is related to reproductive function. Rarely pathological, knees with genu recurvatum can sometimes have some problems like the meniscus pinching. This can happen when the knees are rapidly expanding and the meniscus haven’t had enough time to slip, or during an exercise with a heavy weight that has forced the hyperextension of the thigh. 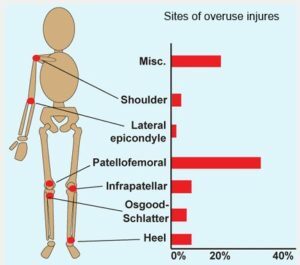 It’s for this reason that it’s recommended to people suffering from a genu recuvatum pathological never to totally block the knees at the end of extension to the squat or to the leg press. For 2 people who are the same size, it’s important to consider the torso-leg ratio. People with proportionally long legs and a short torso will have trouble doing a proper squat without tilting their torso excessively forward. 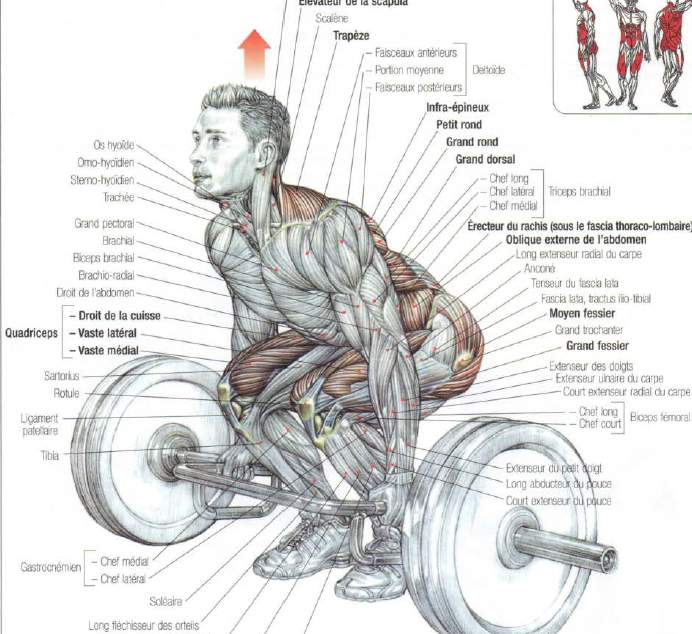 On the other hand, the short torso (which limits the cantilever) facilitates the execution of the good-morning, classic deadlift and Romanian deadlift. People with proportionally short legs and a long torso will have the facility to squat safety without tilting their torso excessively forward. 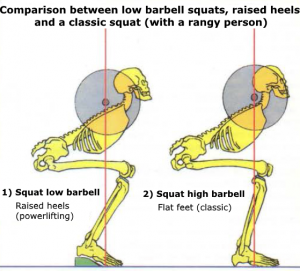 It’s for this reason that the great champions of powerlifting squat specialist have this type of morphology. Inhale, bend your torso forward with your back arched. If you can keep your legs straight or slightly bent. Take the barbell with a pronated grip and straighten your body with your back rigid (your back is not more arched than the starting position). It’s at the hips level that the tilt occurs. Exhale at the end of the movement. 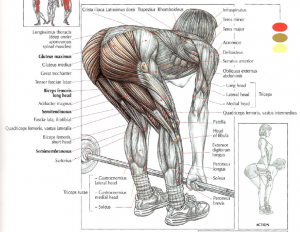 Returns to the starting position without the barbell touch the floor and do it again. 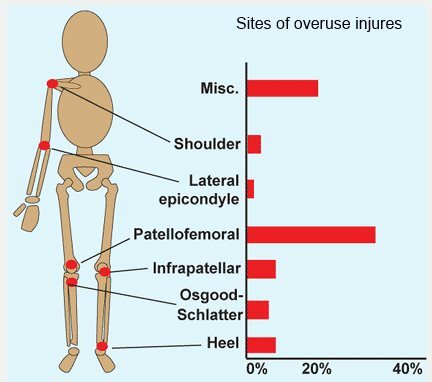 To avoid to have injuries, keep your back straight, it’s important. This exercise works all the spinal erectors, it’s the muscles that run along each side of your spine. These are the muscles that allow you to straighten your spine. When you straighten your torso, during the tilt forward of your hips, this exercise works the gluteus maximus and hamstrings (except the thigh biceps short head). This exercise stretches the back of your thighs when you return to the starting position. 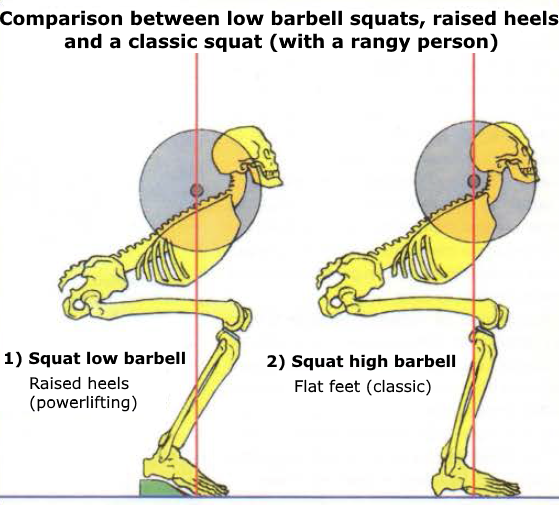 It’s possible to raise your feet compared to to the barbell (with a plate weight or a step) so that the exercise is more effective. This exercise can be used as a stretching movement for hamstring with light weights. The heavier the weight and the greater the gluteus will work compared to the hamstrings to straighten your hips.